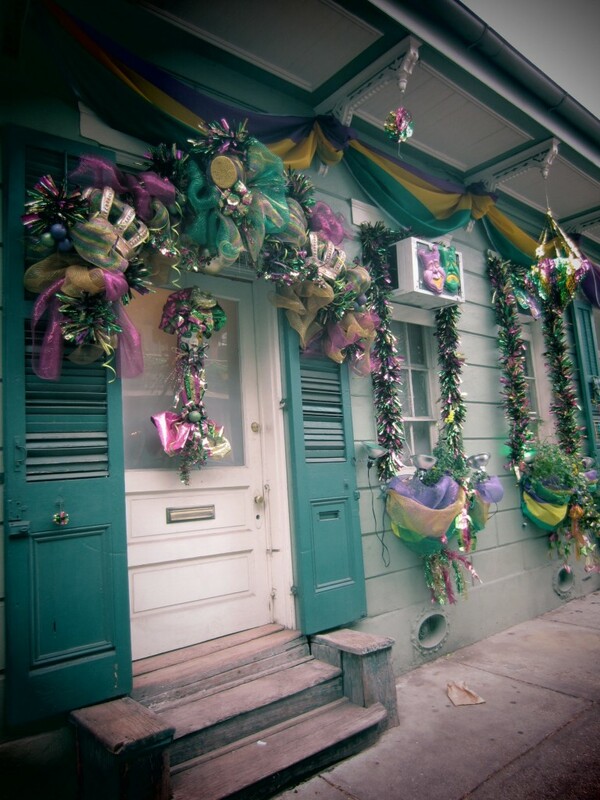 If you plan on celebrating Mardi Gras this year, one way to get festive is to decorate your front door. It’s an easy, beautiful way to celebrate and to get people excited for Mardi Gras. Want to decorate and need some ideas? In this article, we will give you Mardi Gras door decorating tips. Have fun! Festive Fleur de Lis – Feature this popular Mardi Gras symbol predominantly on your front door. To decorate with this symbol, focus on sticking to common Mardi Gras colors such as green, purple and gold. Start with bright, glittery greenery. Frame this around your doorway, going a little over halfway down both sides of the door. Add in accents of gold sticks and purple flowers, taking care to create a lush, decorative frame on the door. Make sure all accents are balanced. Place three Fleur de Lis symbols on the greenery. Put two on both sides of the door and one on top. Although it may sound simple, this is a gorgeous way to decorate your door for Mardi Gras. Celebratory Wreath – If you want to get festive but don’t have the time or money to decorate your whole front door, then try making a wreath. Start with a simple wreath frame and gorgeous, thick ribbon in green, purple and gold. Wrap the ribbon around the frame. You can simply wind the ribbon around the wreath frame, or you can make several bows to cover the frame. Add accents of shiny beads, greenery, shiny ornaments or feathers. In the middle of the wreath, add a centerpiece such as a Mardi Gras mask or a beautiful Fleur de Lis symbol. When it comes to making a wreath for your front door, the only limit is your imagination. Framing Masks – If you love masks as a symbol of Mardi Gras, then this is the door decoration for you. Start by taking art mesh in Mardi Gras colors. Drape this mesh around your doorway and tie a big, decorative bow at the top of the door. Twist the art mesh to make it look more appealing and make sure it is draping in a beautiful manner. Add accents of bright ornaments and glitter. On the top two corners of your door, place two Mardi Gras masks. The whole neighborhood will know that you’re planning on celebrating this festive holiday. Jewel-Toned Door – Not all those who celebrate Mardi Gras like glittery, bright accents. And bright, glittery colors do not work for every house. If you prefer a muted, yet gorgeous front door, try using deeper jewel tone colors. Buy thick, ribbons in dark purple, emerald green and muted gold. Drape these ribbons around your door and tie them off every eight inches or so to create a gorgeous, billowy look. Accent each section of ribbon with an ornament. A simple ribbon wreath balances the ribbon on the door. Add lights to the ribbon for an even more festive appearance. Harlequin Heaven – Along with masks and beads, another common decoration of Mardi Gars is the harlequin pattern. If this is one of your favorite patterns, then make this the highlight of your doorway decoration. Start by gathering wide, shiny ribbons in various tones of purple, yellow and gold. Wrap these around your door frame by creating big, billowy patterns. At the top of your door, use the ribbon to create a crown shape. Take harlequin-patterned ribbon and wrap around the length of the purple ribbon as a highlight. Add accents like bright greenery and shiny beads for depth. Go Simple and Bold – If the thought of decorating your entire front door seems a little overwhelming, you can add simple decoration just with a simple Fleur de Lis. Find a Fleur de Lis symbol that you like and paint it in traditional Mardi Gras colors. For additional pop, use glitter. It’s a classy, traditional addition to your front door and it won’t take a lot of time. When you’re decorating your door for Mardi Gras, think bright and loud. After all, you want to capture feeling the joyous celebration. Stick with the colors green, purple, gold and even yellow. Go for glittery and shiny accents that will be sure to catch everyone’s eye. Mardi Gras decoration staples such as bright beads, jazzy ornaments, gorgeous feathers and decorative masks. There are so many options as to how you can decorate your door. Be creative and make it fun!